New Delhi: National record holder KT Irfan Sunday became the first Indian from athletics to qualify for the next year''s Olympics while finishing fourth in the 20 km event of the Asian Race Walking Championships in Nomi, Japan. The 29-year-old Irfan clocked 1 hour 20 minutes and 57 seconds to better the Tokyo Olympics qualification standard of 1 hour 21 minutes. The Olympics qualification period for race walk events and marathon race has begun from January 1 this year and will run till May 31, 2020. The Olympics qualification period for all other athletics events will start from May 1 this year and will run till June 29, 2020. No other Indian from athletics has so far qualified for Tokyo Olympics. Irfan, who has a personal best as well as national record of 1:20:21 which he did during his 10th place finish in 2012 Olympics, also qualified for this year''s World Championships (September 27-October 6) in Doha, Qatar as he bettered the qualifying mark of 1:22:30. 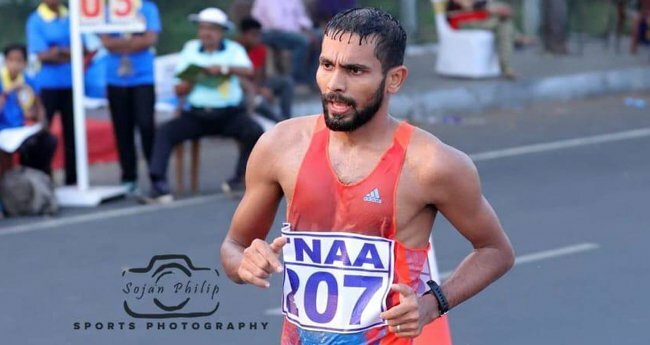 The Kerala race walker had won the 20 km event in the National Open Race Walk Championships in Chennai last month with a time of 1:26:18. He was one of the two Indian athletes who were expelled from the 2018 Gold Coast Commonwealth Games for not adhering to the ''no needle policy'' of the Games. He was disqualified in the 20 km race walk event of the 2018 Asian Games after receiving his third warning for "loss of contact". Japan''s Toshikazu Yamanishi won the 20 km race walk event with an impressive time of 1:17:15 while Kazakhstan''s Georgiy Sheiko and Korea''s Byeongkwang Choe were second and third in 1:20:21 and 1:20:40 respectively. The Asian and World record in men''s 20 km race walk stands in the name of Japanese Yusuke Suzuki who clocked 1:16:36 in the 2015 edition of the same championships in Nomi. Two other Indians, Devinder Singh and Ganapathi Krishnan also qualified for the World Championships as they clocked 1:21:22 and 1:22:12 respectively. They had finished second and fifth in the Chennai National Race Walk Championships with timings of 1:26:19 and 1:26:43. In the women''s 20 km race walk event, Soumya Baby finished fourth with a timing of 1:36:08, well outside Olympics qualifying standard of 1:31:00 and World Championships qualifying standard of 1:33:30.